When it comes to kitchen design most of the focus goes on the cabinetry, worktops and appliances while the walls can be ignored. But since we tend to see things at eye level first, kitchen wall decor can have a big impact on your design. Choice of colour has the biggest impact on any room, not just kitchens so the colour palette is the key. Of course your client is likely to have a good idea of what colour they want the cabinetry and probably the countertops, but what about the complementary colour in your kitchen wall decor ? This is usually a neutral colour and serves as the kitchen backdrop. And then there is a third colour to consider. A colour that makes the kitchen unique. It’s often a bold and unexpected colour that works with your palette. It gives your design visual impact. Use it to make a statement with accessories such as vases, stools or wall art. Use 2020 Fusion to try out different colour palette options and immediately show your clients how their new space will look with different colour palettes. Great kitchens that make an impact have a focal point. A focal point visually jumps out at you. Compared to the rest of the kitchen it is bold and unique. Consider multiple kitchen wall decor options for creating a focal point. You could paint the wall the bold shade from the three colour palette. Or you could feature a large piece of art or a photograph on the focal wall. Alternatively, how about using textural or patterned wallpaper or tiles which can give a real sense of character to the kitchen. Adding layers is another great kitchen wall decor option, so why not think about including the latest trend for kitchens in your designs – open shelf and upper-cabinet free walls. The look lightens up the kitchen by creating a visual space. And why not add accessories on your shelves. But remember whilst it is tempting to add a myriad of accessories it is important not to make the shelves feel cluttered. Use a few carefully selected accessories to make the space feel personal so the customer has an immediate connection. Plus, adding a finishing aspirational touch can give your design the edge that makes your customer say yes. Customer’s immediately feel a connection when you are able to make their design personal to them. And what better way to do this than by creating a carefully curated gallery wall which is unique to them and makes a dull wall interesting. Take the time to find out about your customer’s lifestyle and interests and design a gallery wall that is relevant to them. You can even use 2020 Fusion to create bespoke pictures, personal to the household you are designing for, by incorporating digital images of the children or the family pet in your kitchen wall decor! For a rustic yet refined look how about including a stone wall finish in your design. Different finishes and styles are available and, contrary to popular belief, cooker hoods and shelves can be hung securely from stone. Give a narrow galley kitchen a focal point by painting the “end” wall a statement colour. A contrasting and vivid hue will draw the eye through the kitchen and make it appear longer. Mirrors add light and depth to the room interior so if the room you are designing is small, adding mirrors will expand the space in an instant. 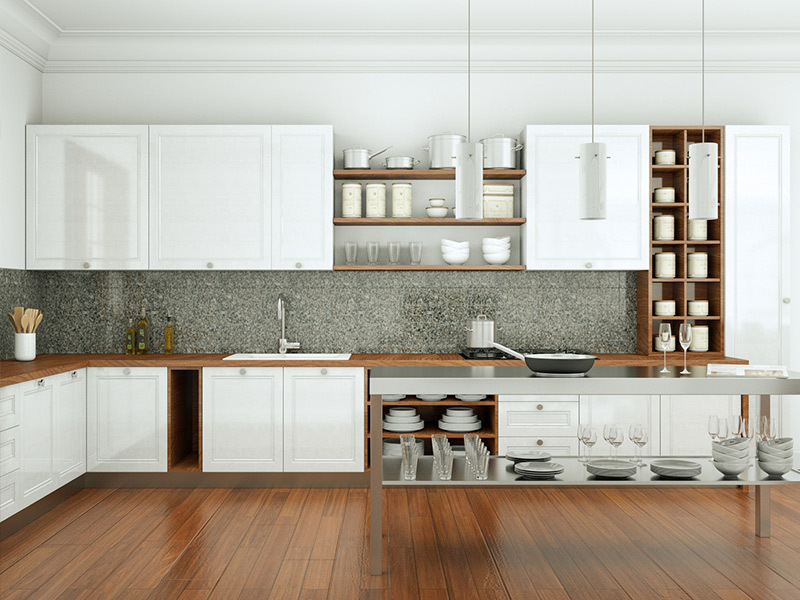 And, if your customer is after a kitchen with a traditional feel then incorporating wood in the kitchen wall decor can add to the overall effect. Wood is often seen as not only brilliantly beautiful, but also traditionally wholesome. So much goes on in a kitchen and your customers are going to spend a sizeable amount time there so it makes sense to take a practical approach to your kitchen wall decor too! Living walls featuring rows of potted herbs are a nice finishing touch for the foodie fan turned budding chef or why not incorporate a chalkboard wall for a family kitchen or for customers who love to make lists or doodle. Adding different wall treatments and room accessories to your designs isn’t complicated. CAD software such as 2020 Fusion, giving you access to AutoCAD, SketchUp and 2020 Cloud, makes it simple for designers to quickly and easily add colours, shelving, or accessories in 3D views to their customer’s existing designs or Panorama and 3D views for new designs with just a few clicks of the mouse, creating a more realistic and visually stunning design. We’d love to know about your favourite solutions and top tips for kitchen walls. Join us in the 2020 Community and share your thoughts. Why not take your first step towards Fusion 6 and try out the current version of 2020 Fusion free for 30 days?